I recently uncovered a really cool way of getting backlinks for your clients or for your own websites. This method is purely for already established domains that have a little history to work with. It won't work for brand new, fresh domains, that nobody heard about. 1. Google your own brand name in Google Photos. As I said, if we aren't talking about a brand new domain there should be plenty of results when googling your own brand name, most of these results will return pictures of your brand's logo or other pictures you will have on your website, overall most pictures should be from your own domain but have patience and test them manually, one by one and check their source. The goal is to discover websites and pages that use your pictures without stating the source and giving you a backlink in return. 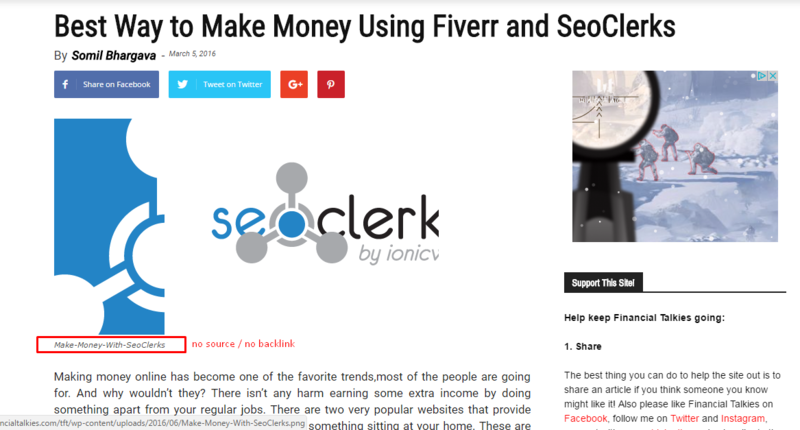 I've made a simple search on google images on the term "seoclerks": the fifth image in the first row lead me to a page that used the SEOclerks logo, talked about SEOclerks and the benefits of making money online as well as this marketplace but had no linked mention anywhere on that page leading to seoclerk.com. So, what did I did? 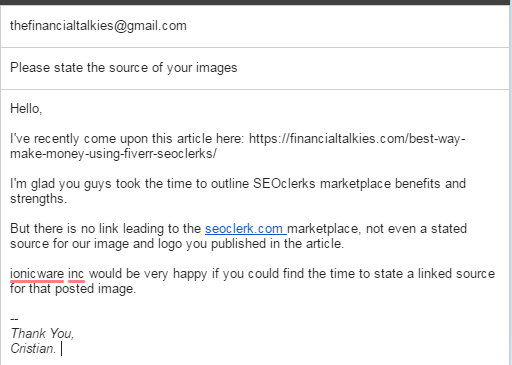 Well, I've contacted them, of course, asking for a linked source for SEOclerk's logo. Of course, they may choose to ignore me, since I'm not officially part of the SEO staff and I hold no official position inside the company. But this is just an example to show you the potential of this link building method. Have a draft template email ready, be nice and contact them from your official domain email. You also need to check out the authority these potential backlink sources have. Go to Moz open site explorer: https://moz.com/researchtools/ose/ and paste the address of the page you want to get a backlink from. In my book, anything that passes the score of 20 in domain authority is good enough to get a backlink from. The example page had a domain authority of 21 according to MOZ and 37 according to Ahrefs. I personally consider to Ahrefs to be the better judge, Moz rarely sees every backlink a page may get, as for Ahrefs, is the best tool for finding out what backlinks a page may hold and therefore the actual authority it can transfer. 2. Use reverse google image search. I think it is time to take this method to a totally new level. If you have a lot of images on your site that you own, you can start by doing a full crawl gathering all the direct image URLs into a data base. For doing this you will need Screaming Frog, you can download it here: https://www.screamingfrog.co.uk/seo-spider/ - if you need to crawl anything below 500 URLs it will be completely free. Now paste your first image URL into the "Paste image URL" area and hit "Search by Image" button. The result will be a reverse image search where Google will search the web for places your image is posted on. Once you get the results you need to manually look at each page results and check if they posted and state a source link leading to your website. You basically apply all the information I mentioned in step one of this article. Bottom line: If you have a website with some history and some decent amount of image based content that you own. Doing image searches and reverse image searches to find pages that don't link back to you can be a great way to building backlinks just by claming your right to have the source stated. These are something very new to me. I did not know we can actually gain backlinks through these ways. I would definitely try it out on the websites I am building for my clients and my own too. Thanks for sharing this. Hopefully you will get a reply from that site, and they will provide a link to seoclerks too. I think this works better if you have a lot of websites and pages to work with. Sending one email to just one webmaster and then waiting for an answer isn't really productive. I hope they do respond, though I doubt it since I'm not an official part of the SEO team and I have no authority behind me. This was just an example to show you how easy it can be to earn extra backlinks just by claiming them. Good luck with this link building method and let us know if it turns to be productive for you! I always knew that the image had an important role within an SEO strategy. I found your strategy very interesting and I will test it on some of my sites. Thank you for sharing one more tip with us! I feel sorry for the guy that got 'caught,' so to speak. Haha. However, you should not be using people's pictures without permission, to be honest. Many of us just take the liberties of going on Google and posting whatever we want for granted. It is rather interesting. Anyway, this method is a good way to get backlinks for sure. I would never have thought about this. It's one of those things that flies over your head. Point 2 is a jewel! Thanks for sharing this tip. I don't own my images. Most of them are free images found in the public domain. But have heard fellow bloggers complaining about others using their images without permission. I am going to share this. Great ideas there and something we should all keep in mind. It is very helpflul to have backlinks as we all know, and if we can create them easily so much the better. I think it is a great thing to do. This is a pretty new knowledge for me in using photos and images to build a backlink with Google. Perhaps I have to note this down because I have big plans for my new website and I wanted to be fully armed from the contents to the keywords and also with the right backlinks that I had to do. Using the photos for building backlinks may not be popular yet and it’s probably nice to put it to test.